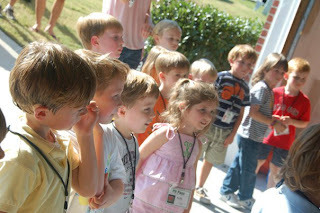 We have been busy this fall season and the kids are growing everyday. Here is Carter at a local pumpkin patch. Brother and sister.. About the most difficult picture to capture these days. 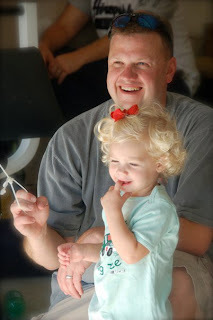 We went to the State Fair last week to enjoy fair food and ride a few rides. As you can see, Abby was not a fan, but Carter had a great time. I was excited Abby ventured out to see the pig. I know that you can't see it because it was baby, but this fair does not have the animals that I am used to, so something was better than nothing. Carter on the Merry Go Round. Abby (picture not posted) screamed the entire time. Soccer has also been in our fall schedule. Carter is on the left. We have been lucky enough to play with the same kids for 3 seasons, so the kids are doing great. It is so nice to see. 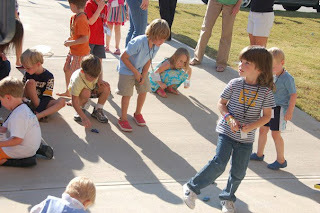 Here are the Meteors.... Halloween costumes will be posted soon. We have a few full weeks of Halloween fun. 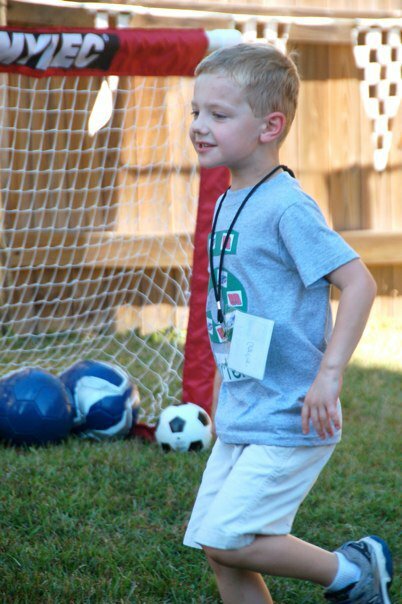 I really can't believe that Carter is 5 already. 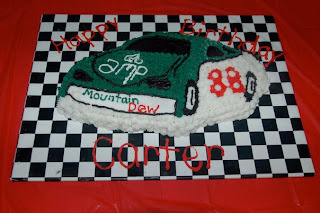 Carter is a huge Dale Earnhardt Jr. fan and I was trying to figure out a way to avoid a Dale Jr. party but when I realized that Carter and Dale Jr. share the same birthday, then we had to go for it. 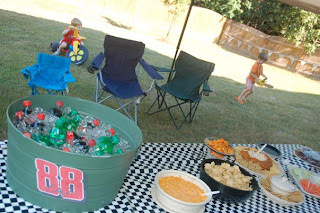 So a Dale Jr. party it was. Carter inside the playhouse in the backyard. 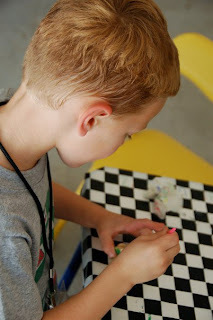 The kids had a great time with this. 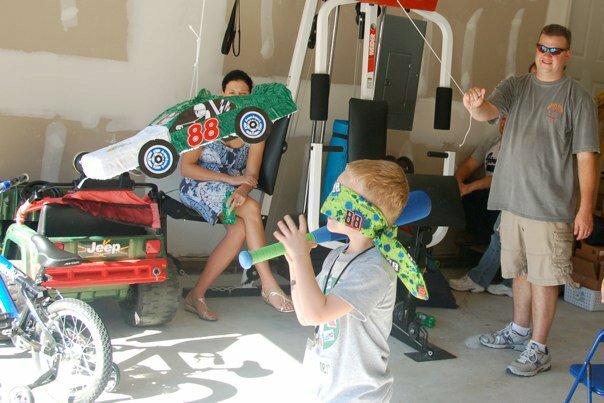 The kids were in the front yard and the backyard with checkered flag pennants lining our yard. 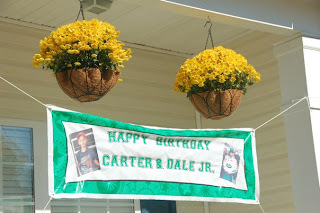 I made a banner for both Carter and Dale Jr. Here is the cake that I made. Carter and his friend Ty from school. 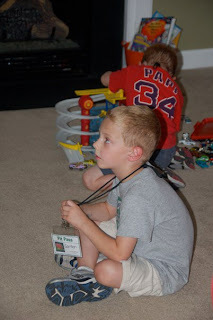 Each child received a "Pit Pass" when they arrived with their name to wear on a lanyard. Abby got into the action too. 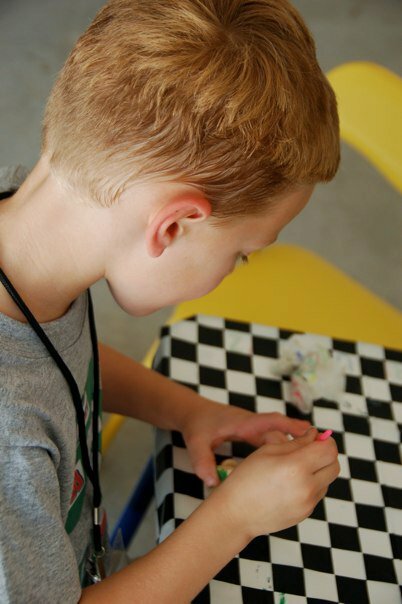 There was painting and coloring in the garage. and lots and lots of running in the backyard. Daddy and Abby helping with the pinata. 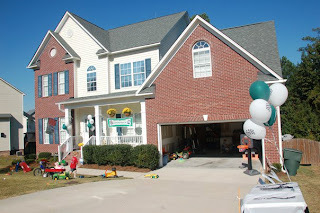 We had 18 kids. 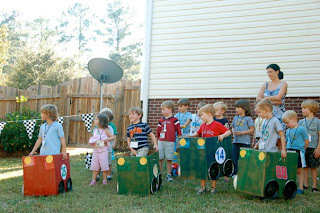 Here they are lined up for the races with the "box cars"
More racing fun. The table is set up with a tent in the backyard, like tailgating. 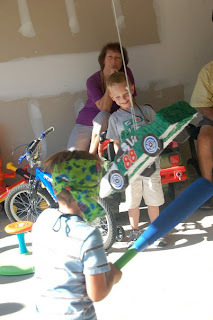 More fun with the pinata. 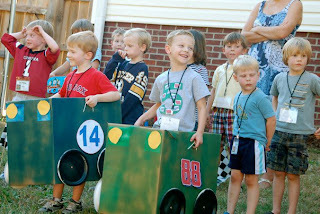 The kids raced cars down the driveway. 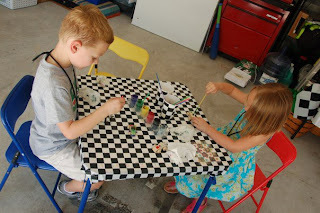 More painting in the garage. 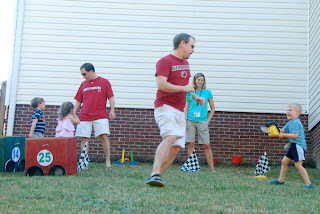 Parents joining in for the ring toss and bean bag toss. The anticipation of the pinata. 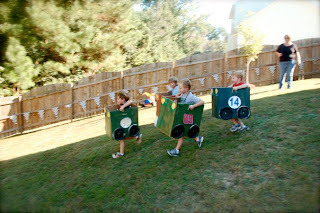 Still racing the cars. 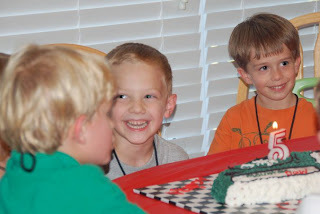 Carter taking a break and watching the race while his friends ate cake. He enjoyed blowing out the candle but is not a big fan of sweets. 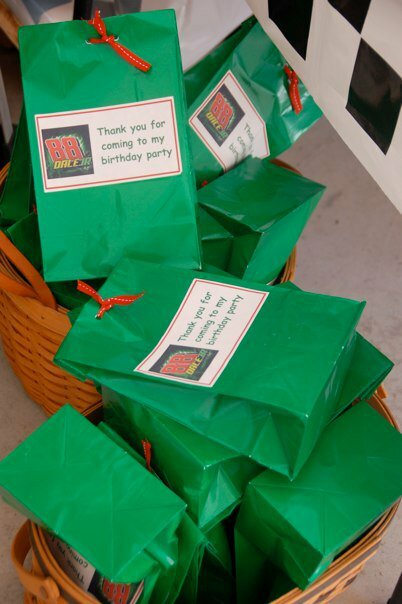 Each child received a goody bag full of Dale Jr. surprises when they left. 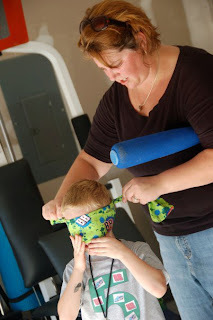 Mommy helping Carter get ready for the pinata. 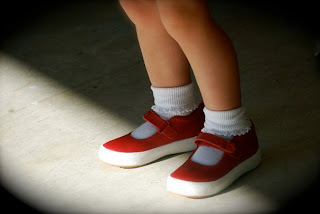 and finally, a girl and her shoes. Abby was all prepared for the event. 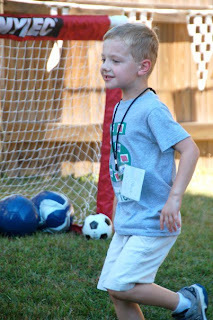 One of Carter's friends, mom, takes great pictures, so I asked if she would take some pictures during the party. She did a wonderful job. I actually have 115 pictures of the special day.